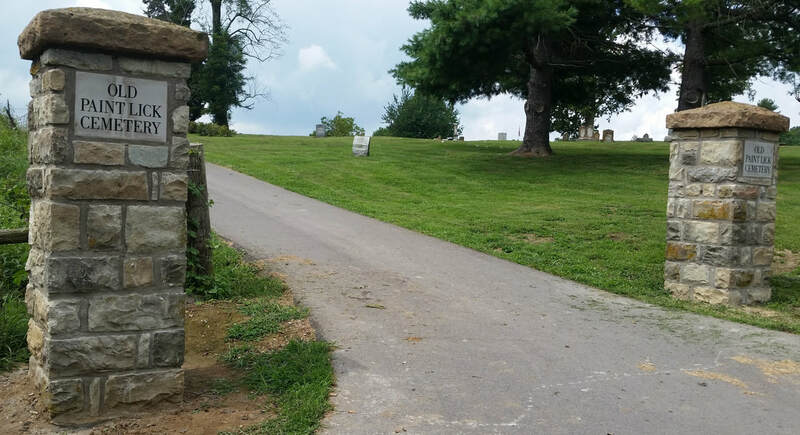 Welcome to the Old Paint Lick Cemetery, also known as Paint lick Cemetery at Manse and other combinations. The cemetery is situated on a small hill with a beautiful view and is well maintained. Old Paint Lick Cemetery is located in the Manse community near Paint Lick, Kentucky and it is the final resting place for over 2400 people including eight Revolutionary War soldiers and many veterans of many wars since. Highway 52 is being widened and straightened. When using GPS to find the cemetery, the GPS may may direct you to make multiple turns prematurely as the GPS is confused by the shifting of positions of Highway 52. So as you approach Paint Lick, stay on Highway 52 until turning on Manse Road. There is a green street sign marking the road. The entrance posts that were once at the entrance to Manse Road have been rebuilt at the first entrance to the cemetery.